Published 2010, Proceedings of the Academy of Natural Sciences 159: 1-24. On BioOne. Abstract. Bourguignat, Locard, Servain, and others of the French Nouvelle École of the late 18th century introduced a number of subgeneric names for the freshwater mussel (Bivalvia: Unionoida) species of western Europe. Based largely upon latinizations of species-group names, most of these generic names end in the characteristic sufﬁx –iana. For the most part, these taxa have not been regarded as valid and, in fact, they have been largely ignored since the early 20th century. However, most of these genus-group level names are available and need to be accounted for as the malacological community moves forward to update the taxonomy of the European fauna. A survey of the relevant primary and secondary literature revealed 131 available –iana generic nomina, only three of which are currently regarded as valid. The type species of each is reported (or designated) herein, and these are used to place the subgenera into the current European system of genera: Unio, Anodonta, Pseudanodonta, Potomida, and Margaritifera. Published 2010, Malacologia 52: 191-197. On BioOne. "Hoeh, Bogan, Heard & Chapman (2009; hereafter HBHC) raise a number of important criticisms of our recent analysis of family-level relationships among the lineages of the Palaeoheterodonta, Graf & Cummings (2006; hereafter G&C). We are pleased to have our conclusions scrutinized from other perspectives. HBHC also raise a number of questions about issues that we apparently did not explain in sufficient detail, and they report that the results of their reanalyses challenge our conclusions. We welcome their reanalysis and discussion. The objective of this article is to keep that debate alive by replying to HBHC." Graf, D.L. & K.S. Cummings. 2006. Palaeoheterodont diversity (Mollusca: Trigonioida + Unionoida): what we know and what we wish we knew about freshwater mussel evolution. Zoological Journal of the Linnean Society 148: 343–394. Hoeh, W.R., A.E. Bogan, W.H. Heard & E.G. Chapman. 2009. Palaeoheterodont phylogeny, character evolution, diversity and phylogenetic classification: a reflection on methods of analysis. Malacologia 51: 307–317. Presented to the Malacological Society of London Molluscan Forum, 30 November 2010, London, UK. Abstract. The family Unionidae is the largest of the six freshwater mussel families, with around 670 species. The majority of unionid species are found on northern continents, with some lineages extending southward onto continuous Gondwanan fragments. Previous family-level phylogenetic analyses of the Unionoida had insufficient taxon sampling to test the traditional classification. As a result, there is disagreement in the literature about the monophyly of the Unionidae, primarily concerning the placement of the African species, Coelatura aegyptiaca. Analyses of mitochondrial data typically place Coelatura outside the larger Unionidae clade, confounding efforts to determine where and when this family originated. To test the phylogenetic position of Coelatura and the monophyly of the Unionidae, we specifically targeted Southeast Asian and African genera not sampled in previous molecular phylogenetic studies. We obtained sequence data of the mitochondrial cytochrome oxidase subunit I gene and the nuclear 28s ribosomal gene for 37 palaeoheterodonts as well as two outgroup taxa. Both parsimony analysis and Bayesian inference robustly recover Coelatura as a member of the Unionidae. We will discuss these results in the context of the biogeography of the family and the evolution of freshwater mussels generally. This research was funded by a grant from the USA National Science Foundation (DEB-0732903). Click here to view (or download) an enlarged jpeg of this poster. 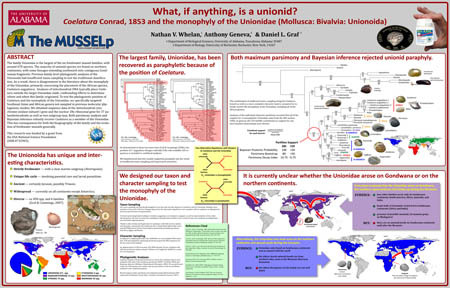 Presented to a joint meeting of the American Malacological Society and the Western Society of Malacologists, 26-30 June 2010, San Diego, California. Abstract.The Unionidae is the largest of six freshwater mussel families with over 850 species in 165 genera. The family is well represented on the northern continents, and various lineages have extended southward onto stray Gondwanan fragments. Phylogenetic work on the Unionidae has not yet approached anything resembling comprehensive, within-family sampling. As a result, few solid conclusions can be drawn beyond (1) the fact that topologies recovered to-date have been at odds with the traditional arrangement and (2) most of the morphological characters that we thought were tremendously important for freshwater mussel classification are homoplastic and contradictory. Since the earliest molecular phylogenetic studies of the Unionidae, the African species Coelatura aegyptiaca has been problematic. 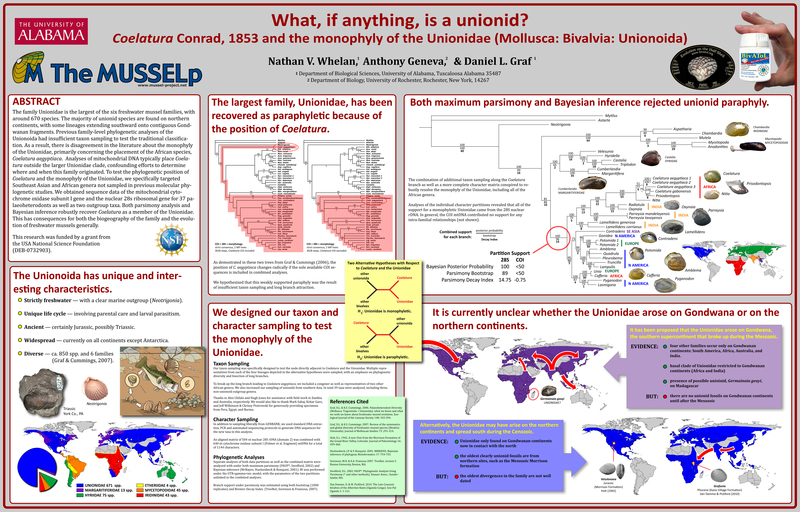 Analyses of mitochondrial DNA have repeatedly challenged the monophyly of the Unionidae, recovering Coelatura as basal to a (Margaritiferidae + Unionidae) clade (= Unionoidea). Moreover, the position of Coelatura has led to speculation about a Gondwanan origin for the otherwise northern Unionoidea. We set out to re-evaluate the position of Coelatura with more extensive character and taxon sampling. In addition to 650+ nt of cytochrome oxidase subunit I mtDNA, we also obtained sequences for 480+ nt of 28S nuclear DNA for 39 species representing four freshwater mussel families and two outgroup species. In our analysis, the African Unionidae is represented by 3 species of Coelatura, Nitia, and Prisodontopsis. Preliminary analyses under maximum parsimony and Bayesian inference recover the Unionidae as monophyletic, with Coelatura and the other African taxa comprising the basal lineage (of those sampled). 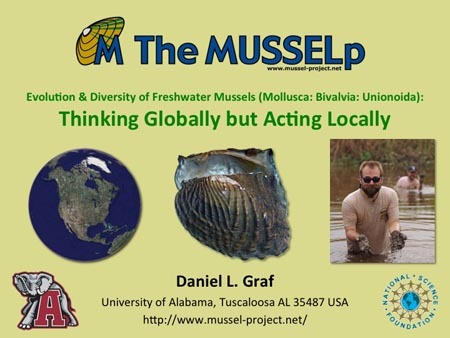 We will discuss our results in the context of global freshwater mussel evolution and competing hypotheses of the origin of the African Unionidae. The slide depicts some of the phylogenetic results. 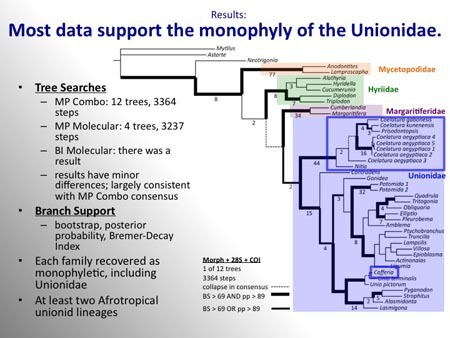 All three analyses (MP Molecular + Morphology, MP Molecular and BI Molecular) supported a monophyletic Unionidae with the African lineages as the basal branch. However, support was weak. Seminar presented at the University of Sydney, 19 March, 2010, Sydney, New South Wales, Australia. Abstract. Freshwater mussels (Order Unionoida) are a globally distributed and ancient group of non-marine bivalve mollusks. Although the species diversity of the clade (ca. 850 spp.) represents a substantial proportion of total bivalve diversity (ca. 5-10%), in recent decades there has been an even larger disproportionate interest in freshwater mussels. This is due primarily to their imperiled conservation status. As a result, there has been an emphasis on parochial contemporary processes. The purpose of my seminar is to advocate for considering broader evolutionary patterns when interpreting local diversity. My research on freshwater mussels focuses on diversity patterns at various scales: from families to species. I will review some (somewhat) recent family-level, phylogenetic work that I have done with an emphasis on the Hyriidae (Austrasia and Neotropics), and I will discuss my work on species-level biodiversity informatics using the Afrotropical assemblage as exemplars. Even at a continental scale, freshwater mussel communities are not “closed systems,” and the answers to local questions are more interesting when they incorporate global answers.